Keeping Up with Google's SEO Changes Writing Assistance, Inc.
For the past two-and-a-half years or so, Google has been tightening up its search ranking algorithms (Google’s “secret sauce” for determining where pages rank for a certain search query). Starting with the original Google Panda update in February of 2011 and continuing with multiple iterations of both Panda (largely related to on-page factors) and what Google calls its Penguin updates (largely related to incoming links) that continue today, a number of websites were hit hard with these changes. For the most part, many didn’t even know it had happened…but once they saw their website traffic take a hit and not recover, they went hunting for explanations. In essence, much of what used to work for getting strong Google rankings just doesn’t work any more. Why? Because many unscrupulous (and even innocently ignorant) people went overboard with trying to manipulate search rankings. Skilled, professional SEO copywriters and SEO specialists (those who make it a point to keep up with the latest industry developments), have been able to help their clients adapt. But many businesses don’t have the luxury of hiring full-time SEO copywriters and specialists and putting them on staff. Those who can afford to hire a consultant often don’t know what to look for. And SEO is a classic example where selecting the wrong professional can do you more harm than good. So what can a business do to recover from the updates, stay out of trouble and continue to build search engine traffic? First, it would be a good idea to be aware of what’s going on – especially with Google since they control a significant share of the search engine market. Having some current knowledge of your own and being alert to changes that have occurred or are coming down the pike will help you if you ever need to interview or hire an SEO consultant or copywriting professional. Set up Google Alerts for such terms as “Google Panda”, “Google Penguin”, or “Google algorithm update.” Be sure to put the terms in quotes or you’ll be getting alerts about anything and everything Google along with mating pandas and crazy penguins. Subscribe to and/or at least regularly visit reliable blogs on the subject. Some of the more trusted sources in the industry include moz.com/blog, Top Rank Online Marketing Blog, Search Engine Land and SEOBook Blog. Ask questions if you don’t understand something. You can invest in the latest eBooks on SEO. Just go to online booksellers to find the latest available publications. Look for up-to-the minute information, not something that was a best seller 5 years ago. Keep apprised of what’s happening with competitors in your industry. Did they suddenly make big changes on their site? With some basic SEO knowledge and awareness of current events, you should get a deeper understanding for the reasoning behind the changes and may decide to make some changes of your own. Ask a professional. If you don’t want to worry about SEO, then you can turn over the task to someone who watches the trends and can help you formulate a plan of attack. Then, they can do the work for you or they can tell you what you need to do to catch up, keep you out of trouble or get you back on track. You don’t need to become an SEO expert yourself, but it would be very helpful if at least a few people in your organization were aware of what’s going on. If you’re going to hire a contractor or add an employee, you’ll at least recognize what questions should be posed to applicants to get a feel if they’re in the know. And, your web and marketing teams can make intelligent decisions when it comes to content updates, site redesigns, content marketing, preparing online press releases and other activities that crop up in the course of day-to-day business operations. Being forewarned is being forearmed. And that’s especially true as Google’s SEO ranking updates continue to roll out. 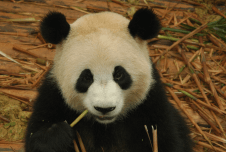 You don’t want to be caught with your SEO down the next time Panda stops by and eats, shoots and leaves. Have you seen website traffic changes from Google’s updates? Do you have more suggestions for coping with them? Please leave a comment – we’d love to hear from you.